Healthy cattle in the United States could be threatened by new HoBi-like viruses, which are related to bovine viral diarrhea viruses. 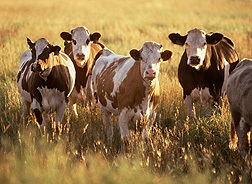 Scientists are tracking a new species of pestivirus that could pose a threat to U.S. cattle. Tentatively called “HoBi-like viruses,” they are related to bovine viral diarrhea viruses (BVDV), which cause significant economic losses to cattle producers worldwide. Originally found in South America, HoBi-like viruses have since been associated with disease outbreaks in Southeast Asia and more recently in Europe. Signs of infection include slowed growth, reduced milk production, higher rates of reproductive and respiratory diseases, and a higher incidence of death among young animals. No vaccines are available to specifically prevent HoBi infection in cattle. At the Agricultural Research Service’s National Animal Disease Center (NADC) in Ames, Iowa, microbiologist Julia Ridpath and her colleagues are characterizing HoBi-like viruses and determining whether available BVDV diagnostics and vaccines are effective in detecting and preventing them. These findings, published in Veterinary Microbiology and the Journal of Veterinary Diagnostic Investigation, indicate a need for new diagnostics and vaccines specific to these viruses. Ridpath and her colleagues at NADC are collaborating with researchers in Brazil and Italy to investigate the prevalence of HoBi. In a study published in the Journal of Veterinary Diagnostic Investigation in 2014, the team conducted a survey of fetal bovine serum collected from animals in the United States. No HoBi-like viruses were detected. This suggests that the viruses have not invaded the country. The first published report of HoBi in European cattle was in a 2010 respiratory disease outbreak. However, ARS scientists and their colleagues from Italy demonstrated that HoBi had been in circulation in Europe earlier than previously reported. They detected the virus in archived samples sent to a diagnostic laboratory in Italy in 2007. Future efforts will continue to involve conducting immunology surveys to ensure that HoBi-like viruses have not entered the United States, Ridpath says. Additionally, scientists are working to develop tests to screen imported animals and animal products to make sure they are free of these viruses.—By Sandra Avant, Agricultural Research Service Information Staff. Julia Ridpath is in the USDA-ARS Ruminant Diseases and Immunology Unit, National Animal Disease Center, 1920 Dayton Ave., Ames, IA 50010; (515) 337-7586. "Assessing the Risks of HoBi-Like Viruses in Cattle" was published in the November/December 2014 issue of Agricultural Research magazine.